Somewhere in between high school and college, I saw Girl, Interrupted for the first time. 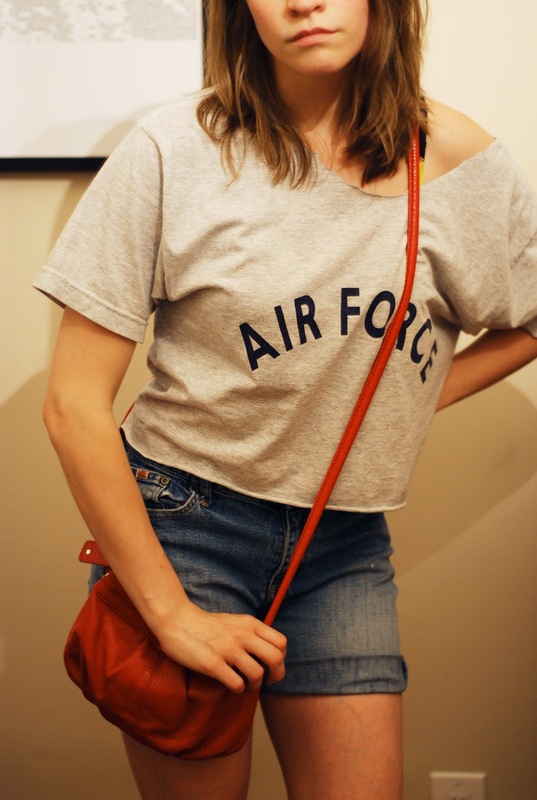 I was so enthralled by Angelina Jolie's performance as Lisa, I went right out and bought myself the first Air Force tee I could find at Value Village in commemoration. For several years now, shirts like this one have been filtering their way to the bottom of my exercise drawer, frequently passed over for more practical tank tops and sports bras. When I unearthed Mr. Air Force during a clean-out earlier this summer, I knew he was long overdue for a makeover. Following the rampant over-sized crop-top trend, I tore the tee to about half its length, then widened the neckline for a more flattering shape. This look is quite a bit more casual than I prefer -- even for an everyday outfit. I probably wouldn't wear it beyond the beach, or maybe on a road trip (and obviously in a psychiatric hospital situation, should one ever arise.) If I planned to wear it more often, I'd tidy up the shirt's neckline and maybe hem the sleeves up a bit. And what a charming surprise to find this pair of cut-offs, still in my possession OVER TEN YEARS after their original purchase date. Yes, kids, I owned these jeans in middle school. I still remember finding them at Pac Sun while back-to-school shopping in the early days of *stretch* denim. Come to think of it, that stretch is probably why these babies still fit! 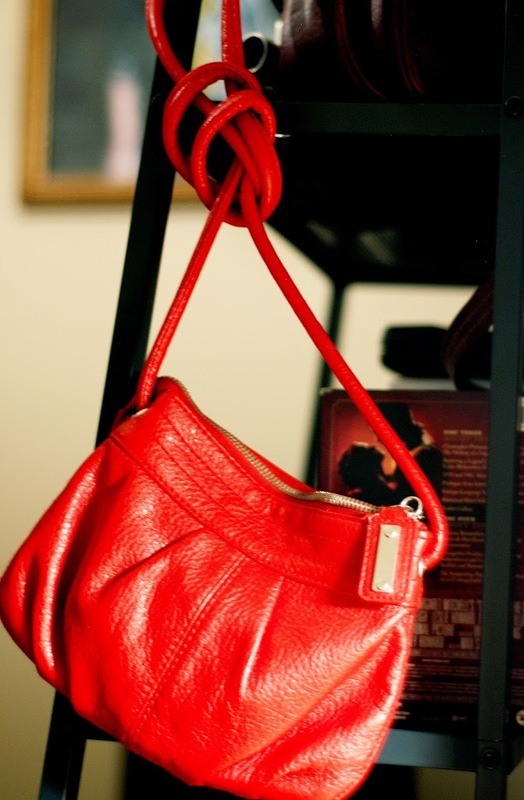 The flame red cross-body purse was a random $5 find at H&M a few years ago. I never expected it would become one of my favorite statement pieces! If you're wary of a color (as I sometimes am about bright red), using inexpensive accessories like this is a great way to test it across your wardrobe. Who knows? You just might find a new favorite shade. Nail Polish: Sinful in "Snowing Gold"